Description After accompanying the French army in the Austro-Italian War of 1859, Meissionier abandoned the small, Dutch 17th-century genre subjects for which he had become known and turned with even greater success to depicting events in the career of Napoleon I. 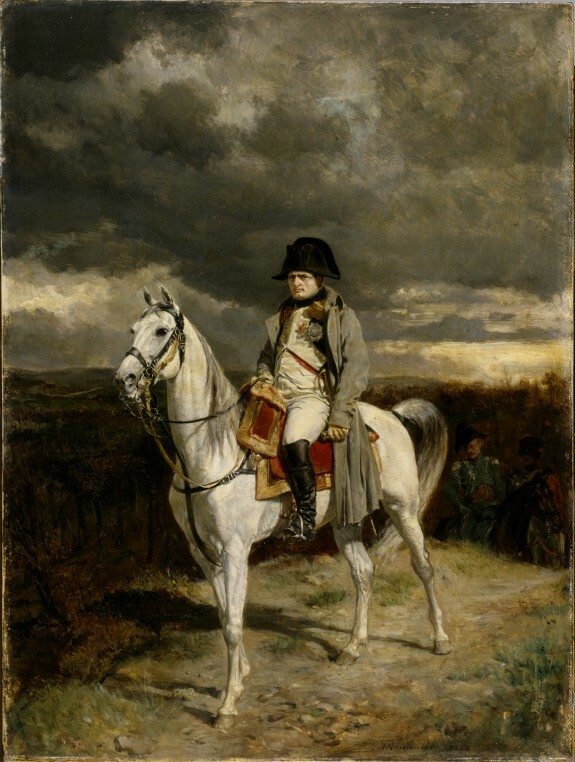 In this small painting commissioned by the subject's nephew, Prince Napoleon, the emperor is portrayed in a forbidding landscape just after his last, hard-won victory in the 1814 French campaign that was fought at Arcis-sur-Aube, near Troyes: 23,000 French troops withstood the onslaught of 90,000 Austrians, but were unable to capitalize on their victory. M. Bingham Studio Exhibit, Paris. 1863. Cavaliers and Cardinals: Nineteenth Century French Anecdotal Painting. Taft Museum of Art, Cincinnati; Corcoran Gallery of Art, Washington; Arnot Art Museum, Elmira. 1992. Vive la France! French Treasures from the Middle Ages to Monet. The Walters Art Gallery, Baltimore. 1999-2000. 19th Century Masterpieces from the Walters Art Museum. Santa Barbara Museum of Art, Santa Barbara; Jack S. Blanton Museum of Art, Austin. 2010-2011. Provenance Prince Napoléon, Vente publique de vingt-six tableaux, Paris, April 4, 1868, no. 18; Bouruet-Aubertot (date and mode of acquisition unknown); J. Ruskin (date and mode of acquisition unknown); J. Ruskin Sale, London, June 3, 1882, no. 111; Defoer Sale, Paris, May 22, 1886, no. 23; purchased by William T. Walters (through George A. Lucas as agent), Baltimore, May 22, 1886 ; inherited by Henry Walters, Baltimore, 1894; by bequest to Walters Art Museum, 1931. The Diary of George A. Lucas, p. 630.